The true story of boxing champion Rocky Graziano, Somebody Up There Likes Me is a tale of remarkable triumph over adversity. 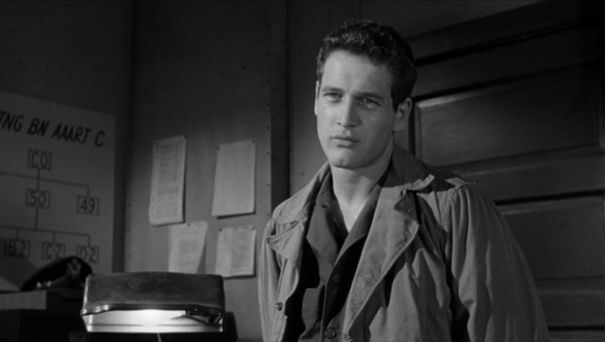 It is also Paul Newman's first big screen success, after the spectacular failure of his debut in The Silver Chalice (1954). Rocco Barbella (Newman) was born into a poor family living in New York's tough Lower East Side. Rocco is blessed with a thunderous punch in his right hand, but with a bum of a father providing no life guidance, he is quickly sucked into a life of petty crime and repeated incarcerations in a succession of increasingly grim prisons. After one stint in jail Rocco joins the army, but soon assaults a military officer and goes AWOL. With the army looking for him, Rocco has his first few bouts in a boxing ring as a middleweight in a desperate attempt to make some money, fighting under the name Rocky Graziano. He demonstrates a knack for boxing, but is soon recaptured by the army, subjected to a court-martial, dishonourably discharged and sent to a federal penitentiary for a year. While serving his time, Rocco gets some training and direction from the prison's boxing coach, and upon his release he takes a crack at a serious boxing career, quickly rising through the ranks. 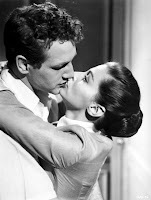 He meets and marries Norma (Pier Angeli), and she helps to give his life focus. But before Rocco can have a crack at the middleweight world boxing title against Tony Zale, he has to fight the corrupting demons of his past life. Paul Newman revels in the intensity of a man fighting against his dad, against the dead-end prospects of his neighbourhood, and against all figures of authority. Rocco should have ended up dead, face-down in the sewer, or frying in the electric chair, and Newman does not hide the boundless hateful energy that is generated within a kid with not much to live for. As Rocco's life turns towards respectability, saved by boxing and Norma, Newman does occasionally slip into outwardly theatrical dumb-guy mannerisms that belong better at the local community theatre. Pier Angeli appears late, but makes a good impression and immediately finds multiple dimensions. Norma needs to both care for her husband and, despite herself, support his passion for boxing. Norma pulling herself together and cleverly boosting Rocco after a resounding defeat is one of the best scenes in the movie. The cast of Somebody Up There Likes Me also includes Eileen Heckart and Harold J. Stone as Rocco's parents, Sal Mineo as a scrappy kid unable to escape the destiny imposed by the squalor of the Lower East Side, and Robert Loggia in his film debut. Steve McQueen appears in an uncredited role as one of Rocco's gang members. The Ernest Lehman script, based on Graziano's autobiography, finds the right doses of ring action and life struggles, painting a well-rounded picture of Rocco, his family, friends, the system that did not know what to do with him, and the salvation that he found in the ring. There are clever touches of humour (Rocco fighting in front of an arena full of men in uniform while he is AWOL) and jolts of gritty realism (Rocco a split-second away from killing a prison guard, which would have in all likelihood placed him on death row). 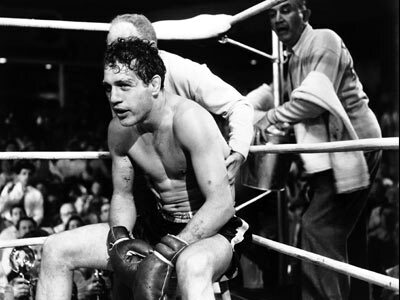 Robert Wise deploys the black and white photography to highlight the bleak reality of Rocco's neighbourhood, and the barbarous intensity of battle within the ring. The boxing scenes are excellent, the final bout between Rocco and Zale draining in its depiction of the mutual punishment suffered by both men. Somebody Up There Likes Me is a story of a brutal sport bringing out the best in a ferocious man. Remarkably, the rigours of boxing are sometimes essential to avoid the body blows on offer outside the ring.